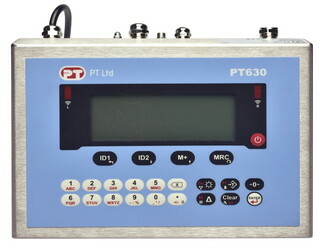 The PT630 is one of the series PT610, PT620, PT630 advanced indicator series, built robust for industrial, agricultural and hygienic area operation. The PT630 is an advanced, high quality general purpose weighing indicator for industry in a durable IP67 stainless steel housing. Ideal for platform, truck and hopper scales among other applications and is available with a wide range of options. The PT630 is approved by Weights & Measures Authorities for use in Accuracy Class III applications with 10000 intervals in accordance with OIML R76. Weighing, and Dynamic weighing for animals and fluctuating loads, check weighing, classifying, filling and counting are standard as is printing which is selectable from 6 languages. Powerful Bi-directional Serial Interface (BSI-BASE, BSI-PRO) communication as standard. A wide range of options is available for integration by Fieldbus connectivity, desk, wall or panel mounting and digital I/O. Easy, practical operation via navigation keys with 6 large 22mm digits, 16 alphanumeric characters 8mm high and wide viewing angle, multi-colour backlit LCD display. The PT630 is powered by AC power with integral mains cable. A version is available for powering from 12-28VDC. Details in the table below show the comprehensive offerings built into this advanced state of the art digital indicator. O1 = Only one Option can be installed at a time. 2 = Third party barcode software required.